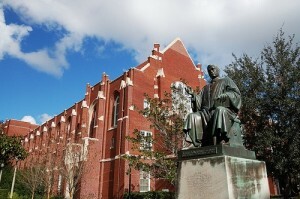 NEW YORK, NY: The University of Florida was ranked number two in the nation for return on educational investment, according to the study reported by the Wall Street Journal’s SmartMoney Magazine. This study compared four years of tuition and fees for graduates to their respective average salaries. The study examined recent graduates (those that graduated three years ago) and midcareer graduates (those that graduated about fifteen years ago). The average cost of a UF degree in 1997 was $26,850, while the current average salary of a UF grad from 1997 is $80,800. Tuition prices around the nation have doubled or tripled in the past 10 years due to the slow economy and reduced state funding for public universities. The average cost of a UF degree in 2009 was $73,476 with the current average salary reported as $46,200. Georgia Tech was ranked number one in the study. The University’s ranking did not go unnoticed, as the Sunshine State News reported Governor Rick Scott’s praise for the University for its cost efficiency and return and urged other Florida universities to strive for similar results. UF President Bernie Machen addressed the ranking, noting that everybody knows UF is a great value, in his address to the senate, as reported in The Gainesville Sun.